The bluish green fleshy leaves are often complimented with a red fringe and make a perfect backdrop for the showy yellow flowers. Stunning when the butterflies arent obscuring the view. 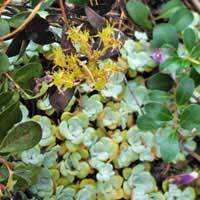 Many sedums are great in the rock garden, and broadleaved stonecrop is no exception. It is easy to grow and suitable for most dry and sunny conditions. Try it near your retaining wall or part of your parking strip garden.